What a difference a couple of days of sunshine makes! It seems to have been an endless winter. Not the ‘proper’ cold of a winter, but one of a more modern kind. Global warming is to blame, apparently, but there have always been vagaries of climate. Anyway. We’ve had three months of hard hitting winter storms here in South West England, with only a couple of rain-free days in the whole of this period. And then last week, Mother Nature seems to have shunted the jet stream away from us and we’ve been basking under a little ridge of high pressure. This has brought us warm sunshine, and a certain air of spring. 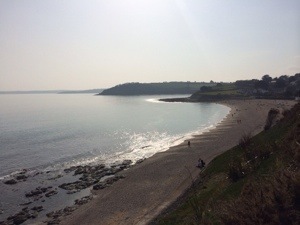 The photo is of the Falmouth beaches, of Gylly Beach in particular, taken on Monday. It was amazing. People were not bent against the wind, head down, not speaking but were shedding layers and greeting each other with a cheery air. Dogs were bounding on the beaches in and out of the breaking waves, and Gylly beach was scattered with picnicking groups of students. My sister was staying, and we walked on to Swanpool beach, remarking on the sound of birdsong. A sound that has been absent of late – or lost against the roar of the wind. It really felt that everyone, man, bird and beast were out to greet the spring. Are we so fickle that a dose of sunshine can lift the collective mood so much? There just seems to be more optimism about in the last days, like people have really cast off their dusty, heavy winter cloaks. I absolutely love the spring, because it heralds the season where it is truly pleasant to be outside – and for us, knowing that we will launch Whinchat back in the water, and we can plan for days afloat. Perhaps it is projection, but if enough people do that, then there is a collective behaviour that develops. Every day there is more light in it. Next week the Spring Equinox is here, the clocks go forward not long after that. It’s all so positive. Fickle or not, I don’t much care. I want to sing about it as much as the birds!